Five pro-democracy activists have pleaded not guilty to charges of insulting the rulers of the United Arab Emirates (UAE), reports say. The pleas were made at a closed hearing in Abu Dhabi amid a clampdown on dissent, say human rights groups. Amnesty International has called on the Emirati authorities to end the trial and release the men immediately. The UAE comprises seven sheikdoms run by ruling families. It has escaped the wave of unrest sweeping the Arab world. At Monday's hearing, some 300 pro-government supporters gathered outside Abu Dhabi's Federal Supreme Court to show their support for the president, Khalifa bin Zayed al-Nahyan, according to Reuters news agency. 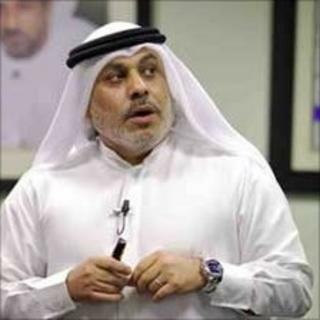 Ahmed Mansour: Accused of using the online political forum UAE Hewar to "conspire against the safety and security of the state in association with foreign powers"
Meanwhile, prosecutors inside questioned two witnesses before the case was adjourned until 25 July, an official told Associated Press news agency on condition of anonymity, citing the sensitivity of the case. The activists - who had called for democratic and economic reforms - include outspoken economics professor Nasser bin Ghaith and Ahmed Mansour. They took part in an online petition calling on the UAE president to introduce direct elections and invest parliament with legislative powers. The current 40-member parliament serves only as an advisory body. Its members are either directly appointed by the ruling sheikhs or elected by citizens hand-picked by the rulers to vote. On Sunday, rights groups - including the New York-based Human Rights Watch and the London-based Amnesty International - called on the UAE to release the activists, who they called "prisoners of conscience". Several of the UAE's Gulf neighbours - including Bahrain, Yemen, Oman and Saudi Arabia - have been rocked by pro-democracy protests inspired by the revolutions in Tunisia and Egypt.